With the spread of smartphones, more and more of us are equipped with the tools to act as powerful witnesses to human rights abuse. But those tools aren’t perfect — a key reason why we worked on Obscuracam, an app to protect the anonymity of people on camera and why we’re again working with The Guardian Project on InformaCam, another app for creators who want to add context that can make their media more verifiable. It is also why we talk a lot about how popular platforms need to adopt new functionalities that make witnessing safer and more effective. 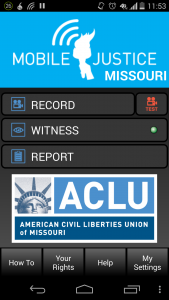 So we were excited when the ACLU recently released an app aimed at helping citizen witnesses capture and report when they, or someone nearby, is stopped by the police. The creation of this app is directly connected to the conversation currently taking place in the United States centered on race, power, and the scourge of police violence that has primarily come down on black males. This problem has been repeatedly thrust back into the spotlight by the deaths of Eric Gardner and Akai Gurley in New York, Tamir Rice and John Crawford III in Ohio, Mike Brown and Kajieme Powell in Missouri, and countless others. That context has spurred a few developers to action, including those at the ACLU. Their app, Mobile Justice, allows users to record video and upload it to ACLU servers so even if the file is deleted (whether accidentally or on purpose like in this case), there is still a copy in a safe place online. Users are also encouraged to submit detailed incident reports whenever they see police stops regardless of whether they recorded the incident on video or not (which should give the ACLU an interesting data set to work from). The app is innovative in other ways. A ‘witness’ function allows users to get notified when someone near them starts recording through the app, the idea being that a notification can bring more eyes to the scene of a police encounter. Another option allows you to have your phone screen lock as soon as you stop recording, so that piece of media is secure should your phone be taken away. The app is being rolled out state by state so each chapter of the ACLU can manage incident reports and fill it with guidance on the users’ rights to observe police in their state. Finally, the app is a great example of an organization trying to fill an mobile application chock full of instructional guidance and legal advice in an accessible manner and without external links. Mobile Justice builds on previous work from ACLU, namely the Stop and Frisk Watch app released in 2012. It has been rolled out in three states so far, customized with guidance to fit each state’s laws related to filming in public and interactions with police. In limited use, primarily with the Missouri iteration, we found Mobile Justice reliable and easy to use (the Oregon version was quite buggy, though, and we haven’t used the Nebraska version much, though it seems to work as well as the Missouri version). The big questions for Mobile Justice are the same ones that will always come up for the creators of these types of apps — finding a large audience for a specialized use, building user trust given the amount of data they’re creating, and, most difficult, creating a user experience that is practical and usable in the heat of the moment. 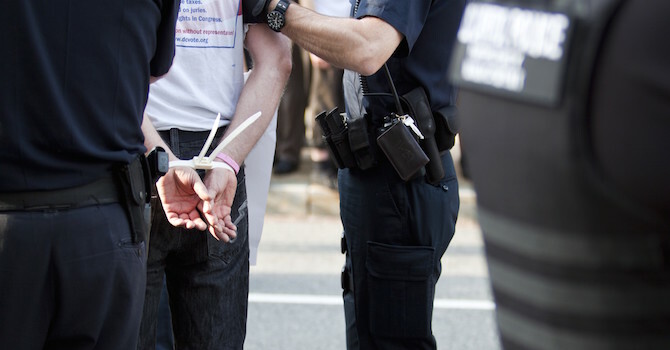 In attempting to give users a mobile tool that can help them hold authorities accountable, Mobile Justice joins apps like Fi-Vo Film, the now-defunct OpenWatch project, and the Police Tape app from another ACLU chapter (New Jersey). Obviously it’s not up to any of these apps to deliver 100% accountability – that will only come with a sustained course of organizing and introspection in America that challenges existing norms around race, power, and crime. But a big part of that conversation will stem from the kind of citizen witnessing we saw in Staten Island when Eric Garner was killed last year. As a result, there is a huge need for apps like Mobile Justice that can widen the array of tools available to citizen witnesses. cc image by Andrew Bossi.